Large, heavy-duty cast-iron hand wheels for effortless blade adjustments. Slotted aluminum blade guard and splitter and a precision-made heavy-duty aluminum table insert. Magnetic switch with overload protection for greater safety. Powerful North American designed, totally enclosed, fan cooled industrial motor. Arbor mounted on heavy-duty, permanently lubricated, sealed ball-bearings. Do you have information to share about the General 650R Table Saw? What do you think about it? Share your thoughts here. "You can't go wrong buying a General 350/650. Even more so now that they come with a riving knife. I love mine and will get the riving knife if available. I just need to figure out a way of hooking a shark guard to the riving knife for dust collection. If I was in the market today for a cabinet saw it would between a General or a Sawstop. I would also look at european slider type saws like the Minimax or Felder." "I too am in the process of purchasing a new cabinet saw, and my decision has boiled down to the General 350-T50 M2M or the 350-T50 M25M. (3hp vs 5hp) My reasons were many. First of all, the trunnion size and design is outstanding. 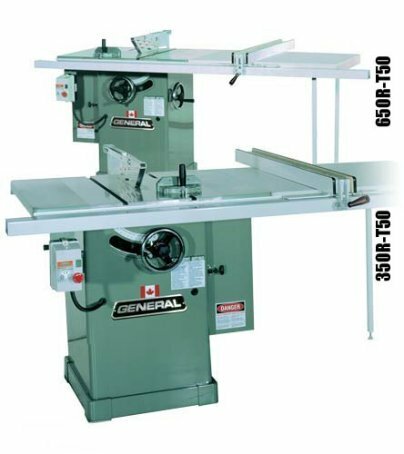 The only picture I can reference is the thumbnail on General's website, but it doesn't do the saw justice. Note how the two belts and pulleys on the arbor shaft are mounted BETWEEN the bearings for full support and minimal deflection under load. (many others have them mounted outboard). Note how the trunnion castings extend to the corners of the cabinet to better distribute and transfer the weight of the carriage. Not all cabinet saws have this. The arbor bearings are common sizes, meaning they are relatively inexpensive and readily available should they ever need replacing (they are not a General-specific part #). The motor is a standard-frame mount. The only way to fully appreciate the trunnion of this saw is to see it in person with the table removed. And I have. And beside the General was a Uni, and it paled in comparison." You may already know some of the other attributes -- seasoned meehanite iron table top and extensions, powder-coated 11ga. steel cabinet with hinged steel door, US made Baldor motors, magnetic switch, General T-fence (not a clone, but IDENTICAL to the Biesemeyer Commercial), cast iron handwheels... I could go on. If you're serious about a traditional cabinet saw, you owe it to yourself to see a General 350/650 and draw your own conclusions. Happy shopping!"